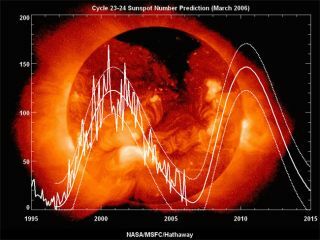 A graph from 2006 predicting the intensity of the current (23) and next (24) solar cycles, based on a computer model. Along lull in solar activity recently may have been causedby changes in the conveyor-belt-like process that moves material aroundthesurface of our star, a new study found. Theconveyor belt pushed plasma farther out toward thesun's poles, and in a slower flow, than it normally does, new computermodels suggest.These variations may have helped to extend an unusually long period ofsolarcalm recently, the findings suggest. Thesungoes through cycles lasting approximately 11 years thatinclude phases withincreased magnetic activity, more sunspots, and more solar flares, andphaseswith less activity. Puzzlingly, solar cycle 23, whichendedrecently, lasted longer than previous cycles, with aprolonged phase of lowactivity that scientists had difficulty explaining. Variationsin solar weather modeled in the new study areakin to El Ni?o-likeclimate patterns on Earth. Justas Earth's global ocean circulation transports waterand heat around the planet and regulates the El Ni?oeffect, the sunhas aconveyor belt in which plasma flows along the surface toward the polesand thenreturns toward the equator, transporting magnetic flux along the way. Recentmeasurements show that in solar cycle 23, the flowof plasma along the sun's surface extended all the way to thepoles, whilein previous solar cycles the flow turned back toward the equator atabout 60degrees latitude. Furthermore,the return flow was slower in cycle 23 thanin previous cycles. Thislonger timescale and varied reach of the sun'sconveyor belt effect could have caused the longer duration of cycle 23,the newmodel suggests. Understandingsolar weather is important becauseoutbursts of charged particles from the sun can greatly affect life onEarth,hindering electronics on satellites and disrupting power grids on theground. Thenew findings come on the heels of the sun's latesteruption, called a coronal mass ejection, which blasted a stream ofionized gasheading straight for Earth. The solareruption,which occurred Sunday, reached our planet Tuesday, leading to anincrease inaurora activity that was visible to skywatchers in Alaska, Canada andthenorthern U.S. mainland. The stunning northern lights show continued toWednesday. Theresults should help scientists better understand thefactors controlling the timing of the solar cycles and could lead tobetterpredictions, the researchers said.